The syllabus hasn’t been reviewed since it came into existence 40 years ago so a review seems reasonable. 1. The exam is so predictable in nature that it’s just regurgitation of material learnt off in class. 2. The subject needs to be removed from the curriculum and replaced with one that is more relevant. I want to respond to the first point. [Students’] experience of learning in Applied Mathematics is often reduced to exam preparation with the examination regarded as predictable. As I mention in the post, I had been teaching Applied Maths for a few years using a textbook when I came across some old exam papers left by my predecessor in the school. I spotted that there was a resemblance between these and more recent questions. It certainly did change how I teach the subject in that when looking for questions I now go to past exam questions rather than a textbook. I wanted to pass this message on to other teachers of the subject, many of whom teach Applied Maths in complete isolation. I have now incorporated all 40 years worth of questions from past papers from both higher and ordinary level into my class notes such that there is now an excellent scaffolding of the work from a gentle introduction using ordinary level questions right up to the most difficult of the higher level questions. I ‘sell’ this notion that I have ‘cracked’ the system to the students. It helps create the sense that we are a team working against the system. It’s a fun idea and quite simpIy I will try try anything if it helps to make the subject easier to teach and easier to learn. I penned that particular post deliberately to increase the uptake of students choosing the subject and to let other teachers know of the resource itself (complemented by a bank of solutions to all questions) which are freely available on my website also. We’re talking about 40 years worth of questions, at higher and ordinary level, most or which are sub-divided into a part (a) and a part (b) which are completely independent of each other. If we get through half the questions on any given topic in class we’re doing well. Secondly, while there is a pattern to many of the questions, there is often a twist at the end of the question and there is an infinite number of ‘twists’ that can be asked, so learning off one won’t necessarily help you with the next one. So it’s a ruse. And anyone who thinks otherwise has never taught the subject. Using the quote above out of context will create a very misleading impression of how I view Applied Maths. Doing questions from past paper can help significantly in your study but you simply cannot get an A just by doing past papers, no matter how many you do. Anyone who thinks otherwise does not teach Applied Maths. Now let’s compare this to Leaving Cert Physics. Physics (and as far as I can tell, Chemistry) are subjects where you can get an A grade by learning everything off by heart. Biology even more so. There is almost no problem-solving in these subjects and there is quite a lot of choice on the paper so if you don’t like a question that requires you to think, you can always skip it and pick a different question instead. This is not the case in Applied Maths. Thinking/ problem-solving is the name of the game and you simply cannot get an A grade by learning past questions off by heart. I go to great pains to warn students of this from the first week in September (and even before then when I am giving a few taster classes in Transition Year). In particular I am conscious of the student who is interested in Science, is a great worker and wants to do very well in all leaving cert subjects. I tell them that hard work will most likely get them the A grade in Physics, but not in Applied Maths. To get an A in Applied Maths you need to be good at solving problems (see extract from TY booklet below). Let’s also consider that you only need to cover past-paper questions in physics for the past twelve years (the course was introduced in 2002) to be practically guaranteed a replica question next June. In Applied Maths you have to go back forty years and the most you’re likely to see is a question similar in context, but which may well have a completely different ending, one which will cost you your A-grade if you can’t solve it. I was aware at the time that the post caused a little stir, but was happy to leave it as it was because it helped stoke a debate which we very much need in this country about the purpose of education. If the author of this report had taken the time and effort to see what I really thought he would have gone to thephysicsteaacher.ie website itself where he would have read the following advice which I give to interested TY students (the link to this document is on the homepage). Who shouldn’t study Applied Maths? This subject doesn’t suit students who just like learning things off by heart. In fact the questions are designed to catch out those very students and whether that is fair or not is a moot point – you are being warned about it now so if you don’t like it you know what to do. You cannot come out of an Applied Maths exam and say to your teacher ‘we never did that question before –you never covered it with us in class’. It is my job to ‘train’ you to tackle problems which you haven’t come across before. So Applied Maths suits people who like solving puzzles (we like to make it sound more impressive so we call it ‘problem solving’). This means being able to think for yourself, and because almost all of your secondary-school education encourages you to ‘learn the right answer off by heart’ it can make a lot of students uncomfortable. The ability to problem-solve is however a very important skill and is highly-valued by many employers. It is one of the reasons why you often see politicians and business people on the news saying that the country needs more scientists and engineers. The NCCA report is scathing in its dismissal of teachers’ claims that we are teaching problem-solving skills. Leaving Certificate Applied Mathematics is also promoted as a subject that enhances students’ problem solving skills. However, with its emphasis on content as opposed to the development of skills and mathematical reasoning students’ [sic] are not problem solving per se but rather, learning to solve particular problem types in mathematical physics. In other words, rather than put down your pen because you don’t know how to proceed, we teach you to look at all available information and choose the next step as if your life depended on it. You may not be 100% confident that it is the correct step, but chances are it will lead to an opening which contains a signpost which will lead you to your destination. Yes we will instil in you an appreciation of knowing the procedure which you will need to follow for each topic, but this will only get you so far and is not to be confused with a solution which you learn off by heart like an essay you buy from The Institute. You will need to think for yourself. Now I regard this as teaching problem-solving skills. This report thinks otherwise. Of course there’s a problem in transferring skills learnt in one context into another area. But that’s not unique to Applied Maths. That applies everywhere in education and is a problem we have yet to find a solution to (the problem is compounded by our current mode(s) of assessment). But we get closer to real problem solving in Applied Maths than we do in any other leaving cert science subject. So if you want to develop higher order thinking it would seem strange that you choose Applied Maths as the one to criticise. Again I refer you to just about every other subject on the curriculum in both the Junior Cert and Leaving Cert curriculums. Find me another subject that demands a similar level of analysing rather than parroting information (the new Project Maths course may indeed be an exception, but it’s still early days with that one). I can’t for the life of me figure out who would have been responsible for compiling this report. The assumptions made about the subject are so ridiculous that I can’t believe it was written by a teacher who ever taught the subject. But why would the NCCA ask somebody who never taught the subject to produce a report on it? No matter what way I look at it, it doesn’t make sense. But then I have often found the workings of the NCCA to be a mystery. Chief examiner reports on state examinations in mathematics over a number of years have consistently pointed to the over-reliance by candidates on rote-learned procedures and the lack of deeper understanding of basic mathematics concepts. There is evidence that students are not able to apply and transfer mathematical knowledge and skills, except in the most practised way and in familiar contexts. That’s all very well, but this is from a Chief Examiner’s report on Maths, not Applied Maths. There have been four Chief Examiner reports in Applied Maths over the years (2000, 2004, 2007 and 2012) and nowhere in any of these does it refer to a lack of problem-solving skills or an inability to ‘apply and transfer mathematical knowledge and skills’. To imply otherwise is mischievous at the very least. The overall standard of answering was quite good, particularly in questions [. . . ] and it was similar to previous years’ standards. I regard that last comment as a vindication of our belief that we teach problem-solving. The fact that students leave the subject not being completely proficient at transferring mathematical knowledge and skills from one subject area to another may have less to do with it being redundant as a subject and more to do with the fact that this mode of learning is at odds with just about every other subject in the school. Having a go at Applied Maths in this respect is a cheap shot. With its emphasis on content and in the absence of any aim or rationale, it is difficult to ascertain what group of students’ needs the syllabus aims to meet. Eric Mazur is a professor of Physics and Applied Physics in Harvard University. He knows the difference between ‘school’ problem-solving and ‘real’ problem solving better than almost anyone. But to go from the former to the latter he didn’t so much change the subject material as how he taught it. The problem in our schools today is also not what we teach – it’s how we teach it. Replacing Applied Maths with a different subject would be a step backwards, not forwards. In the past two years the leaving cert exam simply went too far and the test ended up being too difficult for the average student. Applied Maths is a numbers game in more ways than one and we need to balance noble aspirations against the possibility of alienating potential students (who have little if any experience of thinking for themselves and may well be fearful of the prospect) from coming in the door in the first place. And exam papers need to bear this in mind. Already the subject is seen as ‘elitist’ by many and I suppose I have the option of using that to just attract the top students. In sixth year I have 20 students, in fifth year I have 26. From the word go I make them familiar with my mantra: “Applied Maths teaches you what to do when you don’t know what to do”. 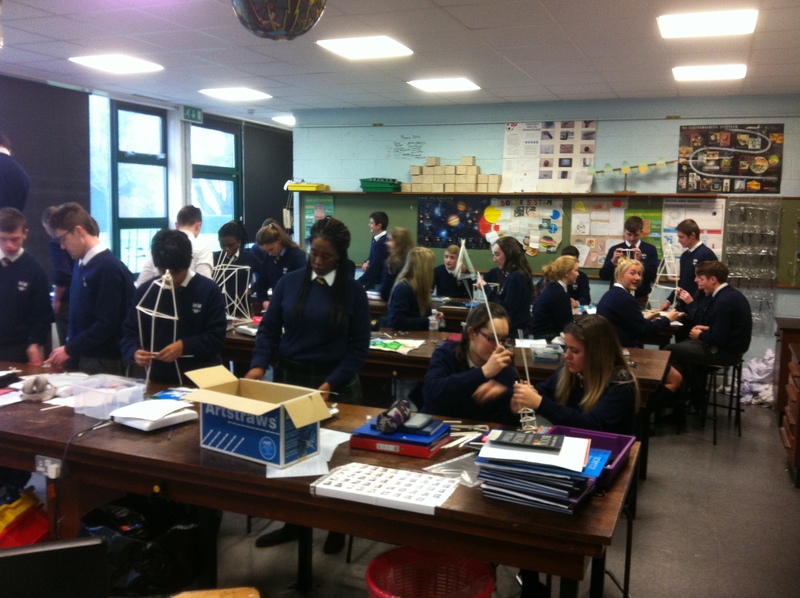 To emphasise this idea in fourth year I give students the following challenge: using only 30 paper straws and 1 metre of tape, build a free-standing tower as tall as possible such that it can hold up a marble for at least 5 seconds. And that’s it. No other rules. There are limited resources, limited time and not necessarily any one best way. They have a ball. And then I tell them that Applied Maths is the mathematical equivalent of this. This needs to be a fully thought-out discussion, listening to all interested parties, not a hatchet-job. It may well be the case that we need other subjects on the curriculum; it’s hard to argue against the inclusion of proposed options such as computer programming, business mathematics and game theory. I’m just not sure that Applied Maths is the subject which needs to make way for this. But whatever decision is made, let it be for the right reasons, and let that decision be made on the basis of evidence, not ignorance. While I am a member of the Irish Applied Maths Teachers’ Association (IAMTA), all views are my own and are not necessarily representative of anyone else or any organisation. Tomorrow the IAMTA hold their annual conference and the discussion document is on the agenda on the day. 2014 Applied Maths paper: ‘disgraceful’ or simply ‘testing’? Update: A number of students have taken the time to write a considered responses in the ‘Comments’ section below, so please take the time to read it to get a student’s perspective. You might also want to look at the relevant page on the boards.ie site where there is an ongoing debate about the fairness of the exam. The leaving cert Applied Maths syllabus is just one page long. For each topic it’s not at all clear how to prepare students properly other than by looking at past questions. Therefore when a paper comes out that varies considerably from the usual format, it’s not surprising that students end up struggling to deal with it. This is exactly what happened in June 2013. And again in June 2014. But maybe Applied Maths isn’t meant to be a subject where students rely on past papers as a guide. Perhaps it should an ‘anything is fair game to appear on the paper’ approach. If that’s the case the only people it will suit will be the elite students. In which case it completely goes against the DES promotion of STEM subjects in recent years. The real killer punch here is that this is the second year in a row where the Exams Commission has produced a nasty paper. Once is (just about) understandable; twice is a disgrace. Giving feedback on these papers is difficult. First impressions can be quite deceptive; it’s only when you sit down to do out the questions that you get a feel for their true level of difficulty. It doesn’t help that Applied Maths is the last exam on the Leaving Cert and many teachers will no longer be in the school to meet the students in person to get immediate feedback. I personally didn’t realise how bad last year’s paper was until I gave it out as revision to this year’s sixth years after Christmas. It was a bit late then to make any complaints. I’m not going to make the same mistake twice. Apparently there is a new person setting the paper and perhaps he wishes to ‘put his own stamp’ on the paper. That would be understandable, but if only if it was done very gradually. The change in the Applied Maths paper over the past two years has been anything but gradual. It is not outside the bounds of possibility that one person has the power to kill this subject completely. The numbers taking the subject have always been quite low; many teachers are teaching it outside normal school hours to no more than two or three students. Others who are teaching it in a school timetable have perhaps ten students and while a school could allow for this ‘luxury’ in the past, the insidious increase in the pupil-teacher ratio over the last few years has resulted in schools being forced to withdraw the subject from the normal timetable. My own numbers are normally between ten and fifteen. 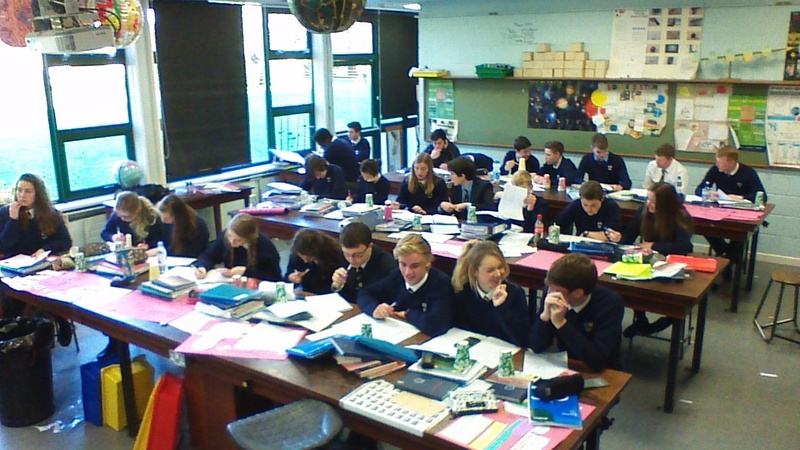 In the last couple of years I have made a big effort to promote the subject including running ‘taster classes’ during lunchtime and coming in to their normal maths classes. This year 24 students have signed up to take the subject in fifth year. I’m now going to speak to all of them in the first week and ask them to think very carefully about going ahead with the subject. From a personal point of view it’s nice to say that I have a full class of students, but I’m not going to play with their futures just to massage my ego. In the past I have told interested students that they don’t need to be a genius at Maths to do Applied Maths; I’m now going to have to roll back on that one also. Over the past two years the paper has been referred to as ‘challenging for the brighter students’. This is surely a euphemism. If the top students found it difficult then the C/B students would find it nothing short of a disaster. And as a colleague reminded me recently, when reviewing these papers there’s no point looking at it from the perspective of the A student – chances are they’ll still come out with an A regardless. But for the average student the consequences are likely to be much worse. For example two of my students (one a C student, the other a B student) simply gave up half way through. It was their seventh subject and they realised that it was going to end up as their worst result by a long shot. I could never condone a student leaving an exam early, and certainly not the Leaving Cert exam, but these are both conscientious students and I understand completely their frustration. I have contact details for each student and their parents and have sent them all an email apologising for the paper. While I didn’t set the paper, and nobody would ever think of blaming me, I do somehow feel responsible; should I have seen this coming? Should I have warned them in advance? Should I have discussed worse-case scenario with them? I certainly will do all this next year – it’s just unfortunate that it will have been a year too late for this year’s cohort. I will also need to speak to my sixth years at the beginning of the year. Many of them do eight subjects in fifth year and drop one at the beginning of sixth year. I’d love to tell them that this year’s exam was ridiculously difficult and that the Exam Commission would never make the mistake of doing this twice. The fact of course is that they just have done it twice. And it has coincided with a new guy setting the paper. And there’s no indication that it will be any different next year. And then I’ll get them to review the evidence for themselves. At this stage we would have 5 questions covered to Leaving Cert Higher Level standard. The students simply need to look at the questions over the past ten years and see how the questions in 2013 and 2014 compare. I may be wrong, but my guess is that it won’t be pretty. Again, it would be very dishonest to try and keep them in my class just to play the numbers game. I’ve no doubt I’ll lose some of them as a result. I can only hope that the number of students who jump ship won’t be too great. A few years ago we set up a discussion forum to help the many Applied Maths teachers who were working in almost complete isolation. Luckily I didn’t have a class doing the Applied Maths exam this year but this paper was an awful advertisement for students to do such a specialist subject. How many students would have got one full question correct or would have thought they got one correct?. Could the answers have been more uninspiring? It was my first year teaching a highly motivated student applied maths in one year (repeat lc student). A massive effort was put in to preparing for the exam and my student is very diligent and hardworking. How is it then that she can get no reward when faced with a paper like that? In my opinion I thought it was a disgrace and my student came out visibly upset at the thought that her work throughout the year has gone to waste. 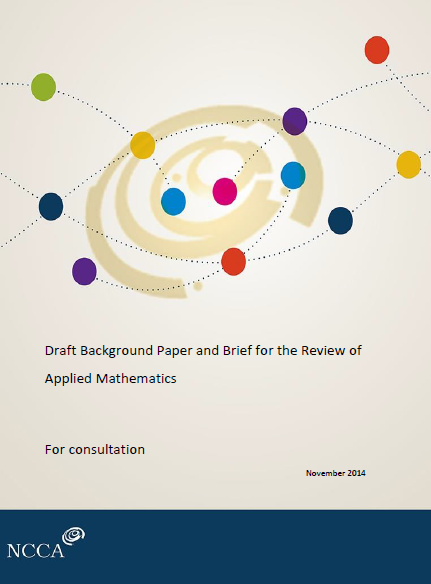 Whilst the applied maths book is great it has no resemblance to 70 per cent of the questions asked in the 2014 paper. I’m raging to say the least. I agree fully with the comments below. This was my first applied maths exam class and what a baptism of fire! I am very disappointed with the paper and my students were very upset with it. This negative reaction will filter through and our numbers will be adversely affected by this paper. The exam required a great deal of knowledge, aptitude, calmness and an ability to get through large amounts of data, according to Dorgan. The length of the paper may not have given students a chance to think about how to approach questions. I don’t know Hilary Dorgan but his comments repeat what I alluded to earlier; if the strong students were really tested, how must the C grade students feel? [The] subject spokesperson for the Association of Secondary Teachers Ireland (ASTI), said the higher level exam had some new features but the style and content were all welcome, with the opening question on linear motion featuring no underlying problems. He said students might have been unnerved by the appearance of the more challenging elements in the first, rather than the second parts of questions on projectiles, particle dynamics and differential equations. He said a question on collisions was set out in a way not seen before but students should have progressed well on it, and most should have been familiar with issues in a relative velocity question that looked very long at first. I don’t know the ASTI spokesman either but it’s not likely that we’re going to meet up anytime soon; we appear to inhabit different planets. Either that or he was guilty of the same offense as me – a quick browse through the paper giving the impression that it wasn’t too bad, whereas a more detailed analyses would reveal that it was anything but. Applied Maths is one of the few subjects that has no counterpart at Junior Cert level. As such students often have little idea about the subject, which partly explains its low take-up rate for the Leaving Cert. The following are some ideas I use when promoting Applied Maths in the school. As teachers we don’t usually go talking to individual students about their subject-choice for the Leaving Cert but it’s important to note that many students may not consider doing Applied Maths simply because nobody has ever suggested it to them Sometimes just a quiet word with one or two students who you know are comfortable at maths may be enough to make them consider a subject they otherwise wouldn’t have thought of. I run two or three ‘taster’ classes around this time each year just so the students have some idea about the subject. I give them out a workbook and also a separate ‘Common Questions which Students ask about Applied Maths’ booklet which aims to answer many of the questions they may have about the subject (see below for the link). I also ask their houseperson to forward on an email from me to the parents of all TY students and I attach the ‘Common Questions’ booklet for them to look through. I encourage the parents to get back in touch with me if they need any more information. Parents and students may be reluctant to sign up to a subject if they are unsure what’s involved, and sometimes just letting them know that you’ve available for them might be enough to make them reconsider. Having said all that, I didn’t find last year’s paper to be one which would encourage the uptake of the subject. I have attached the information booklet below – it would need to be edited to suit your own school. I have copied and pasted information from both the IAMTA journals and website into the booklets so I make no claims as to their originality. I have had three students work on this for a week or so, scanning in page after page after page during their lunchtime breaks. So a big thank you to Eoin and the two Jacks for giving up their spare time to help Applied Maths teachers and students all over the country. The document is available from the homepage here and I have received permission from the author Oliver Murphy. I can’t image that the publishers have any issue with my making solutions available to a textbook that is no longer in print, but if they do I will of course remove the offending article. Apparently the solutions to the new edition of the textbook are available from folens.ie if you are using that book. Personally I don’t use any textbook. The notes that I use contain questions on each topic going right back to the beginning – 40 years ago. I also issue a copy of the marking schemes/worked solutions for each question and we pretty much get stuck into exam questions right from the get-go. All of my resources are freely available from the website above. At the moment most topics list the questions chronologically; I am in the process of re-setting these to that the questions are graded in relation to difficulty within each type of question. That may take a while. It may not seem a big deal, but if you’re a teacher of Applied Maths then worked solutions – whether they be Department of Education marking schemes or full solutions – can be a life-saver. The official marking schemes go back to 1995 but for some reason you can only get back to 2001 on the Department’s site examinations.ie. Over the course of the last couple of weeks one of my first-year Science students has been diligently giving up his lunch-times to scan in these earlier marking schemes which are not online (from 2000 – 1995), along with full solutions to 1994 and 1993. These are all now available on the Applied Maths solutions page which is here. Together with the existing older scanned in solutions it now forms almost a complete set of solutions going back 35 years. Over the last couple of years I have converted the exam questions for all of these into Word format and these can be accessed here. Alternatively I have incorporated the questions into a series of booklets (one per topic) where the questions are grouped by similarity. These booklets also contain introductions to the topics plus gradual lead-in questions taken from Ordinary Level papers. Many of the questions have a ‘how-to-solve’ guide which gives you some help in answering the question without giving you the full solution (the full solution is available elsewhere). As always, you can download these one document at a time or alternatively just send me a memory stick and I’ll copy them on and post them back. Oh – and thanks to Eoin Robinson for all his help; If the resource is useful you might leave a comment and thank him! To go with the previous post on Applied Maths papers there is an accompanying set of notes on each topic here. Many of these are 30 – 40 pages long so don’t print unless you have to; when I distribute these to students I use the photocopier to photocopy two pages onto one (A3 – A4) and also to go double-sided. This reduces the number of pages by a factor of 4. Each topic has its own contents page at the beginning which breaks the chapter up into sub-topics. Each sub-topic then has an introduction and some exam questions with worked solutions (or at least most do – it’s still a work in progress). There is then a guide to answering the individual questions (which also includes the answers), although I think this only goes from 2010 to 1995. Every question from 2010 to 1970 is included in the booklet with similar-type questions arranged together. If you’re a teacher feel free to copy any or all of this to suit your own purposes; life, as always, is simply too short for anything else. There is also a 1 page guide to approaching the exam itself on the same page. A bit late in the year perhaps, but for anyone out there studying (or teaching) Applied Maths it might be worth noting that I have uploaded a full set of exam questions in the Exam Material section of the website. These go from 2010 all the way back to 1970. I scanned them in from some old papers I had filed away and then converted them to Microsoft Word so that they can be easily incorporated into other documents (more on that later). It was an interesting exercise in that up until that point I thought that Applied Maths was one of the very few subjects which required more than simply learning off past questions, but it turns out that if you are prepared to cover the full gamut of questions then almost every question you will see in the 2011 or 2012 paper will be very close in apperance to at least one question which has appeared in the past. Because I have converted into Microsoft Word there is sure to be the odd typo along the way, which is why on the same page you can have access to the original papers which I scanned in and uploaded (these only go back to 1976 because the quality of the 1975 – 1970 papers was simply too poor to read after scanning). In the meantime I am working on a set of solutions for all these – some of which have already been provided by a colleague so it’s a case of trying to fill in the gaps but when I have them I intend to stick them up on the same page – stay tuned, but don’t hold your breath! Sure to be of use to someone – try to avoid printing these if you can. And good luck with the study.